“Patients with Cushing’s disease have excess mortality [risk],” says Oskar Ragnarsson, MD, PhD, associate professor and a senior consultant in internal medicine and endocrinology at Sahlgrenska University Hospital in Gothenburg, Sweden. He is the author of the study, which appears in the Journal of Clinical Endocrinology & Metabolism. The researchers analyzed data from 502 men and women, all of whom were diagnosed with Cushing’s disease between 1987 and 2013 as indicated in a Swedish health database.1 The average age of these patients at diagnosis was 43 years, and, 83% of these individuals were in remission. During a median follow up of 13 years—half followed for longer, half followed for less time—the researchers noted 133 deaths, more than the 54 that had been anticipated in this patient population. From this data,1 Dr. Ragnarsson and his team calculated that people with Cushing’s disease were about 2.5 times more likely to die than the general population. The most common reason, with more than a 3-fold increased risk, was attributed to events associated with cardiovascular disease, encompassing both heart disease and stroke. This group also appeared to have a higher risk of death from infectious and respiratory diseases, and conditions related to gastrointestinal problems. Fortunately, just being in disease remission helps to reduce the risk of all-cause mortality,1 the researchers’ report, with both men and women whose Cushing’s disease is well-managed having a two-fold lower risk of death during the follow-up period.1 Those in remission who were receiving growth hormone had an even lower risk of death than those on other forms of treatment. Those who had their adrenal glands removal experienced a 2.7-fold higher risk of death, while those who were treated with radiotherapy or had pituitary surgery did not have an increased risk associated with cardiovascular events. When glucocorticoid therapy was added, it did not affect results, according to Dr. Ragnarsson and his research team. Bottom line? “Even though patients in remission have a better prognosis than patients not in remission, they still have more than a 2-fold increased mortality [risk],” he says. The study, he says, is the first to uncover a high rate of death from suicide in Cushing’s patients. It has been reported before, but the numbers found in this study were higher than in others. The findings, he says, emphasize the importance of treating Cushing’s with a goal of remission. Ongoing surveillance and management are crucial, he says. “Also, evaluation and active treatment of cardiovascular risk factors and mental health is of utmost importance,” Dr. Ragnarsson tells EndocrineWeb. The study findings underscore the message that ”the priority for patients is to achieve biochemical remission,” says Tamara L. Wexler, MD, PhD, director of the NYU Langone Medical Center Pituitary Center, in reviewing the findings for EndocrineWeb. I have another concern about the findings, she says. While the method of analysis used in the study suggests that the length of time from diagnosis to remission is not associated with increased death risk, ”it may be that the total exposure to excess cortisol—the amplitude as well as duration—is related to morbidity [illness] and mortality [death] risk.” And, she adds, any negative effects experienced by patients with Cushing’s disease may be reduced further as remission status continues. In addition, Dr. Wexler considers the authors’ comments that sustained high cortisol levels may impact the cardiovascular system in a way that is chronic and irreversible ”may be overly strong.” She believes that the total cortisol exposure and the duration of remission may both play important roles in patients’ ongoing health. She does agree, however, with the researchers’ recommendation of the need to treat heart disease risk factors more aggressively in patients with a history of Cushing’s disease. Equally important, is for patients to be warned that there is an increased concern about suicide, she says, urging anyone with Cushing’s disease to raise all of these concerns with your health practitioner. Overall, the study findings certainly suggest that it is important for you to know that if you have Cushing’s syndrome, you are at increased risk for not just heart disease but also mental health disorders and other ailments than the general population, she says, and that the best course of action is to work closely with your doctor to achieve remission and stick to your overall treatment plan. You see your doctor at least once a year to have annual checks of your blood pressure, blood sugar, and other heart disease risk factors. For those of you receiving cortisone replacement therapy, you should be mindful of the need to have a boost in your medication dose with your doctors’ supervision when you’re are sick or experiencing increased health stresses. Cushing’s disease patients in Sweden have a higher risk of death than the general Swedish population, particularly of cardiovascular complications, and that increased risk persists even in patients in remission, a large nationwide study shows. The study, “Overall and disease-specific mortality in patients with Cushing’s disease: a Swedish nationwide study,” was published in the Journal of Clinical Endocrinology and Metabolism. The outcomes of Cushing’s disease patients have improved with the introduction of several therapeutic approaches, such as minimally invasive surgery and cortisol-lowering therapies. However, mortality is still high, especially among those who do not achieve remission. While currently patients in remission are thought to have a better prognosis, it is still unclear whether these patients still have a higher mortality than the general population. Understanding whether these patients are more likely to die and what risk factors are associated with increased mortality is critical to reduce death rates among Cushing’s patients. A team of Swedish researchers thus performed a retrospective study that included patients diagnosed with Cushing’s disease who were part of the Swedish National Patient Registry between 1987 and 2013. A total of 502 patients with Cushing’s disease were included in the study, 419 of whom were confirmed to be in remission. Most patients (77%) were women; the mean age at diagnosis was 43 years, and the median follow-up time was 13 years. During the follow-up, 133 Cushing’s patients died, compared to 54 expected deaths in the general population — a mortality rate 2.5 times higher, researchers said. The most common causes of death among Cushing’s patients were cardiovascular diseases, particularly ischemic heart disease and cerebral infarctions. However, infectious and respiratory diseases (including pneumonia), as well as diseases of the digestive system, also contributed to the increased mortality among Cushing’s patients. Of those in remission, 21% died, compared to 55% among those not in remission. While these patients had a lower risk of death, their mortality rate was still 90% higher than that of the general population. For patients who did not achieve remission, the mortality rate was 6.9 times higher. The mortality associated with cardiovascular diseases was increased for both patients in remission and not in remission. Also, older age at the start of the study and time in remission were associated with mortality risk. “A more aggressive treatment of hypertension, dyslipidemia [abnormal amount of fat in the blood], and other cardiovascular risk factors might be warranted in patients with CS in remission,” researchers said. Of the 419 patients in remission, 315 had undergone pituitary surgery, 102 had had their adrenal glands removed, and 116 had received radiation therapy. Surgical removal of the adrenal glands and chronic glucocorticoid replacement therapy were associated with a worse prognosis. In fact, glucocorticoid replacement therapy more than twice increased the mortality risk. Growth hormone replacement was linked with better outcomes. In remission patients, a diagnosis of diabetes mellitus or high blood pressure had no impact on mortality risk. “Further studies need to focus on identifying best approaches to obtaining remission, active surveillance, adequate hormone replacement and long-term management of cardiovascular and mental health in these patients,” the study concluded. Laparoscopic adrenalectomy — a minimally invasive procedure that removes the adrenal glands through a tiny hole in the abdomen — can be safely performed in obese patients with Cushing’s syndrome, a retrospective study reports. The surgery resolved symptoms in 95% of cases, reducing cortisol levels, lowering blood pressure, and leading to a significant loss of weight in morbidly obese patients. The study, “Minimally invasive approach to the adrenal gland in obese patients with Cushing’s syndrome,” was published in the journal Minimally Invasive Therapy & Allied Technologies. Cushing’s syndrome results from the prolonged secretion of excess cortisol, the major glucocorticoid hormone. While most cases are caused by tumors in the pituitary gland, up to 27% result from tumors in the adrenal glands. In these cases, the standard therapeutic strategy is to remove one or both adrenal glands, a surgical procedure called adrenalectomy. However, because glucocorticoids are key hormones regulating fat metabolism, Cushing’s syndrome patients are known to be prone to obesity, a feature that is often associated with post-operative complications. In this study, researchers aimed to compare the outcomes of morbidly obese patients versus the mildly obese and non-obese who underwent a minimally invasive procedure to remove their adrenal glands. The approach, called laparoscopic adrenalectomy, inserts tiny surgical tools through a small hole in the abdomen, along with a camera that helps guide the surgeon. The study included 228 patients (mean age 53.4 years). Of them, 62 were non-obese, 87 were moderately obese, and 79 were considered morbidly obese. There were 121 patients with tumors in the right adrenal gland, 96 in the left gland, and 11 in both glands. High blood pressure was the most common symptom, affecting 66.7% of the participants. Surgery lasted 101 minutes on average, and patients remained in the hospital for a median 4.3 days afterward. Six patients had to be converted into an open surgery because of uncontrollable loss of blood or difficulties in the procedure. Post-surgery complications, most of which were minor, were seen in seven patients. One patient had blood in the peritoneal cavity and had to have surgery again; another patient had inflammation of the pancreas that required a longer admission. The analysis showed no statistical differences among the three groups regarding the length of surgery, length of stay in the hospital, or the rate of conversion into open surgery. However, in obese women, surgeons chose a different surgical incision when removing the left adrenal gland, “suggesting that the distribution of visceral fat in these patients could constitute a drawback for the [standard] approach,” researchers said. After the surgery, 95% of patients saw their symptoms resolve, including cortisol levels, high blood pressure, and glucose metabolism, and none had a worsening of symptoms in the 6.3 years of follow-up. Obese patients also showed a significant reduction in their weight — 2 kg by 18 months, and 5 kg by the end of follow-up. Overall, “laparoscopic adrenalectomy is safe and feasible in obese patients affected with Cushing’s disease and it can lead to the resolution of the related symptoms,” researchers said. The benefits of the surgery in patients with Cushing’s syndrome “could be extended to the improvements and in some cases to the resolution of hypercortisolism related symptoms (i.e. hypertension or even morbid obesity),” the study concluded. Patna: Improper functioning of the Pituitary gland usually results in excess or under production of hormones that leads to a formation of mass called tumor, which can be benign or malignant. Such tumors in this gland can create numerous serious medical conditions by interfering with the normal functioning of the endocrine system and pituitary gland. Diagnosis at an early stage can help the treatment procedure to be totally non-invasive with the use of advances technology called as Cyberknife. Cyberknife which is the most advanced radiation therapy is completely non-invasive therapy available for the treatment of benign as well as malignant tumors. 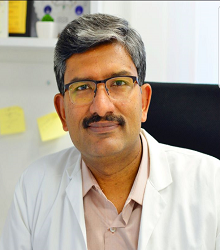 This therapy works the best for some pituitary tumors that are upto 2 cm in size and is a very powerful and effective technique for treating patients suffering from early stage primary and medically inoperable tumors. The treatment is safe to administer and also offers a new option in patients with recurrent disease or a single disease in the body. Depending upon the hormonal variations in the body, there can be a variety of symptoms. The most common symptoms include Headaches, vision problem, tiredness, mood changes, irritability, changes in menstrual cycle in women, impotence, infertility, Inappropriate breast growth or production of breast milk, Cushing’s syndrome which is a combination of weight gain, high blood pressure, diabetes, and easy bruising, the enlargement of the extremities or limbs, thickening of the skull and jaw caused by too much growth hormone. Pituitary gland, which is also known as the master gland has the most important function of producing hormones that regulates the critical organs of the body including thyroid, adrenal glands, ovaries and testes. It is a small pea-size gland located behind the eyes and below the front of the brain. Some tumors produce hormones known as functional tumors, and others can cause the glands to secrete too few or too many hormones. Also if the tumor pressed on the nearby structure, for instance the optic nerve, can also limit a person’s vision. Moreover the procedure makes use of the most sophisticated image guidance technique to focus high doses of radiation directly to the tumor spot which eliminates the chances to damage the healthy cells as in any other methods of treatment. Huang X, et al. Pituitary. 2019;doi:10.1007/s11102-018-0927-x. The use of 3D-printed models could lead to less operation time and blood loss and fewer postoperative complications in adults who undergo endoscopic endonasal transsphenoidal surgery for pituitary adenomas and other conditions, according to findings published in Pituitary. Jiang and colleagues conducted a retrospective analysis of 20 adults who underwent endoscopic endonasal transsphenoidal surgery at Union Hospital in Wuhan. Participants were included based on similar tumor sizes, the presence of no other diseases and nonintuitive tumor identification. All surgeries in the cohort occurred between January and August 2017, with 10 participants (mean age, 44.4 years; 50% women) receiving CT and MRI before surgery; the remaining 10 also received an operation with 3D printing (mean age, 41.2 years; 50% women). To create the 3D models, images from CT and MRIs were combined. The 3D printer then used this information to create the model, which took between 2 hours, 10 minutes, and 4 hours, 32 minutes, to design and 10 hours, 12 minutes, and 22 hours, 34 minutes, to print. After surgery, the researchers found that mean operation time was lower in participants who had 3D models compared with participants who did not (127 minutes vs. 143.4 minutes; P = .007). In addition, there was less blood loss in participants with 3D printing compared with participants without (159.9 mL vs. 170 mL; P = .009). The researchers noted that there were postoperative complications in 20% of the 3D-printing group and 40% of the CT and MRI alone group.